If you're new to using felt fabric, you may be wondering what kind of thread you should use for sewing felt with. It is so different to other fabrics with its matted and rather fuzzy texture. There are two main kinds of thread that are particularly suitable for felt sewing. Some crafters swear by standard sewing threads that normally come on a spool and others swear by embroidery floss - so which one is right? The answer is: both are. There are times when sewing threads make a better choice and other times when floss is more appropriate. You'll discover which you should use and for what situations below. There are two main types of thread that I use for sewing felt with. I use polyester sewing threads - the exact same kind that I use for machine stitching. And I also use stranded embroidery floss. Both of these thread types are essentials in my sewing tool kit. Only someone very experienced with felt sewing would realize that, in most situations, you should be using two types of thread. This is because the two main types of threads used for sewing felt with have rather opposite strengths and weaknesses. If you are serious about wanting to learn all about sewing with felt, perhaps even wanting to start or grow a business with your hand sewn items, you really should know the differences between these main thread choices. The main types of standard sewing threads that you can get are cotton which is a natural thread (often preferred by quilters) or synthetic threads which include polyester and nylon. There are also rayon threads (oddly enough which are neither completely natural nor completely synthetic) and they are also a very popular choice for sewing with. I love the fact that cotton is a natural material and I can see why many sewers rave about it. However, it really is not as durable. I found that cotton threads would often snap and break right in the middle of a sewing project, as well as tangle and knot easier, which led to a lot of frustration. It is not nearly as tough as polyester or nylon threads and that is why I do not use it. Over the years I've spent hand and machine stitching, I've gravitated firmly towards polyester threads because they work brilliantly for either situation which makes them so completely versatile. They also come in a wide choice of colors and spool sizes making them perfect for whatever type of project I'm working on. Although I mostly use polyester threads for more functional sewing, they can also be used for decorative sewing too. They make a good choice for many basic embroidery stitches. I'd normally recommend embroidery floss though for embroidery because it just looks even better. ⭐ Polyester threads are long lasting and very strong. I have never managed to accidentally snap these threads whilst sewing by hand or machine. Because they are so strong, polyester threads are absolutely ideal wherever you need a strong stitch or seam. It is an ideal choice for sewing one piece of fabric to another and for sewing accessories such as buttons in place which need a strong hold. Like many sewers, I've developed a taste for certain brands. My favorite polyester threads are Gutermann. This company also manufacture cotton threads if you prefer although I would choose the polyester variety because of all its strengths. Gutermann polyester threads are readily available in a wide range of colors and also spool sizes. If you plan to mostly hand stitch, the smallest range of Gutermann spools (approx 110 yards) are really more than ample to last you a long while. There is no need to buy the larger spool sizes unless you plan to use them for machine stitching as well - which I do. That makes these threads great value for money because I use them for both machine and hand stitching. Embroidery floss should never technically be used for any sewing that requires reinforcement because it is nowhere near as strong or as durable as polyester threads are. You should avoid using floss to sew around seams that are likely to be handled a lot. Plush handmade toys made for children should never be sewn together with embroidery floss because they can be pulled apart much more easily. A massive no-no is sewing on buttons, beads and any small parts on toys with floss since they could prove to be a choking hazard if pulled off. In fact, any toys designed for young kids should never have these items on anyway. Even though embroidery floss is not as strong and durable as polyester threads are, it really is a beautiful choice of thread to sew with on felt. I just love how soft it is and what a gorgeous sheen it has. You can buy floss in infinite choices of colors as well as variegated color change threads which I adore. Do make sure to buy decent brands like Anchor or DMC instead of being tempted by those bulk buy bracelet threads which are of varying quality. Example of an item I've stitched using embroidery floss. Since this pink mushroom home is purely decorative (and not a toy) it is fine to sew it using floss. 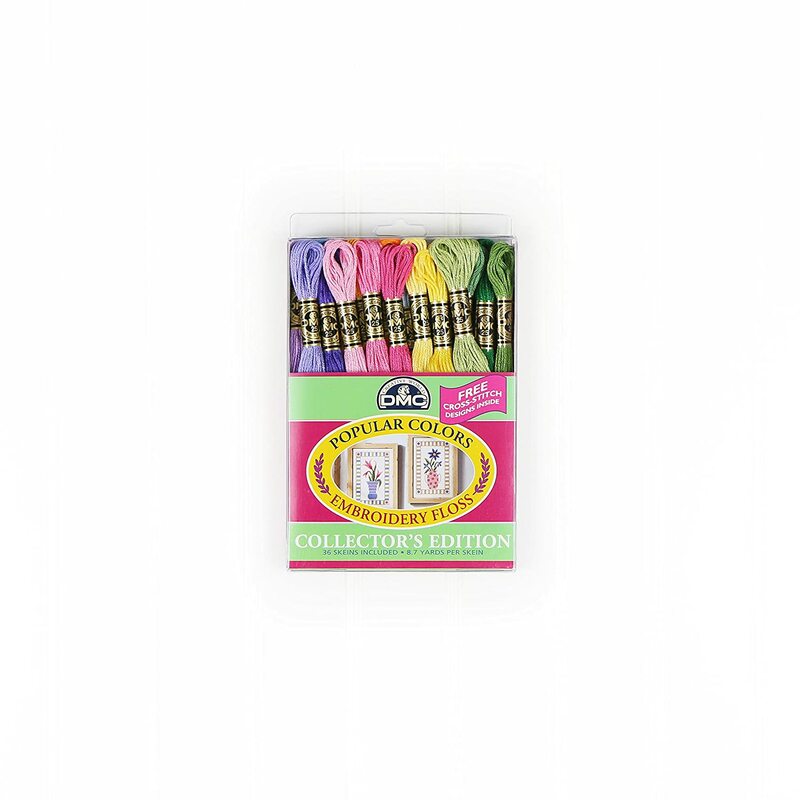 Embroidery floss really is the perfect choice for adding in more decorative features to your felt hand sewing crafts. It looks stunning on finished felt plushies and items due to its beautiful silky sheen and luster. Although it is possible to use polyester threads for many decorative and embroidery stitches, they really don't work well for everything. For example, French knots require some body and height to create them which really only comes from using special embroidery threads. 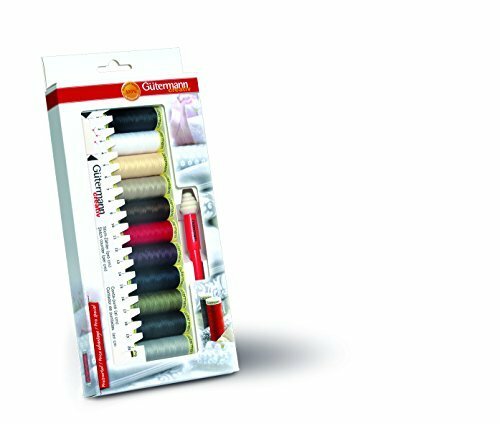 ⭐ Embroidery floss comes in a wide range of brands (such as Anchor and DMC) and also styles. They are normally sold as skeins which are loosely folded lengths of threads. I wind mine onto plastic bobbins for easy use and storage. You can get special threads such as variegated and metallic threads as well as a much bigger range and choice of colors. Variegated floss is a type of embroidery thread that I particularly love to use. These variegated threads can gradually change shade and even color while you are stitching because they are dyed with different color variations. Used with some thought and care, variegated threads can make even the most ordinary felt projects have a bit of wow factor. As a beginner who is starting to sew felt items and plushies, it makes much more sense to start off by using any existing threads that you have. You can gradually add to your thread selection as you progress with this craft. This will really help you to keep the costs of this new craft down to a minimum.